Saw this on Facebook this morning. Made me think. Think about how much I love the idea of unconditionally loving "You" but struggle with the reality of that idea. 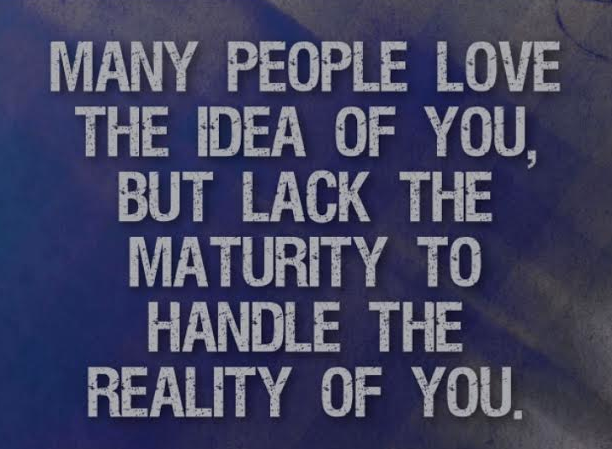 Perhaps, as the image indicates, it is all about maturity. I do seem to be more accepting of "You" than I once did but often struggle with the reality of you. Can you relate to this struggle of loving in general and loving in specific? How do you deal with loving the reality of you? Do you find ways to embrace the imperfection in others or simply close your eyes to them? I have no answers but know that I often struggle with the reality of unconditionally loving "You". Reminds me of Linus of Peanuts statement I love mankind, its people I can't stand. Sometimes it is easier to love in the abstract then the concrete. Love that Wanda. Good description of "The Reality of You". Merry Christmas to you too Linda. Not sure vanilla. Perhaps it begins with the recognition that we are all broken and in need of divine fixing? I make a flippant joke, and you answer in sincerity; and you got it 100% right. Reality of you -- I think most of us do not even know the "reality of me", making it hard for others to "handle" us. And in the same way making it tough for us to handle others if they do not really know who they are, if they are unaware of they affect others. I found myself in this situation recently where I find that some people inadvertently affected me in ways that made me uncomfortable, but with me being me, I kept quiet and accepted them as they are, hard at first, but getting easier now. Good thoughts Pearlie. Not addressing your example specifically, I wonder if a part of loving unconditionally is helping others to discover the "reality of me"?